A fun-filled day of felinie festivities and canine cavorting! Festival-goers will enjoy rows of sponsor and vendor booths, live music, a Kid's Zone featuring face painters, characters, clowns and magicians, food and much much more. Dog training demonstrations throughout the day. Proceeds to benefit the Brooklyn Animal Foster Network, a network of more than 500 homes, and New Hope Partner of the Animal Care & Control of NYC. 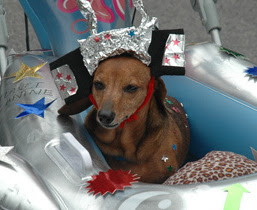 The dog picture here is actually from last year's BARC Parade in Williamsburg, but in any case, GL loves a good dog parade.